Comical stunts performed by this amusing pair reveal the friendship at the center of this fast-paced novel. J. T. Lundy’s amusing novel, Saving Grapes, follows an unmotivated slacker whose desperation sends him on an adventure that could change him forever. Jason Barnes is not the typical, successful hero type. With a failed marriage, a dire financial situation, and a lousy job retrieving golf balls on a driving range, life is far from good. When his emotionally distant aunt makes a deal with him to help him one last time, Jason jumps at the chance to let her bail him out. But when she unexpectedly dies and Jason’s ex-stepbrother steps in, backing out of the aunt’s agreement and threatening to have Jason serve a prison term, the situation becomes desperate. With his best friend, Stumpy, in tow, Jason jets off to Paris to try to take possession of the family vineyard and earn enough money to buy his way out of trouble. Though Jason’s attempt at romancing a French woman is explored, the book proves less a romantic comedy than a buddy farce. Learning that the vineyard is run by nuns (accompanied by their protective little dogs, Matthew and Mark), complications begin to escalate for Jason as he discovers it won’t be so easy to cash in on his inheritance and avoid jail time. He and Stumpy embark on some madcap moments, including disguising themselves (as a monk and lawyer, respectively), sneaking women into their quarters without the nuns finding out, and auctioning off priceless religious relics. The pace of the novel is effective, picking up speed toward the end as Jason’s deadline to avoid jail gets closer and he has to decide how far to go to save himself. Though there are some moments that stretch credulity—such as being able to easily enter a foreign country with someone else’s passport—most of the pair’s antics are zany, humorous, and in sync with the tone of the story. 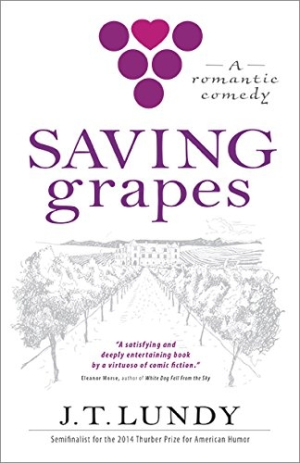 Undeniably amusing, Saving Grapes is a light, fun read, with enough twists and turns and madcap adventure to keep readers entertained.